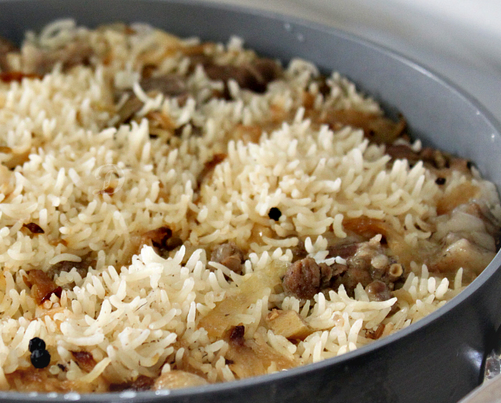 This special desi rice dish has a traditional taste. Degi Pulao is very much popular amongst Pakistani people, it is highly demanding during weddings and other festivities. Boil Meat with cloves of garlic, piece ginger, whole coriander, fennel seeds, black cumin seeds and 4 glass of water. Cook untill meat is tender. Now separate meat from stock Then Soak 1 kg Rice. In pan heat oil, add 2 chopped Onion, Black cardamom and green cardamom. Now add boiled meat with yogurt and fry well. Add stock, green chilies with soaked rice. Cook well, spread mint leaves and other spice powder. Lastly add kewra water and serve hot. Nick veal tenderloin in thickness with a long-bladed knife fine. Cut the ham into strips and press them into the cuts made in the veal tenderloin. Peel and finely chop the celery. Preheat oven at (210 ° C). Heat oil in ovenproof casserole. Make it brown the meat on all sides. When it is well colored, remove from the pan. Replace it with chopped celery and cook, stirring a few minutes, without browning. Put the meat, salt and pepper. Pour 2 glasses of water in the bottom of the pan. Cover and bake. 1Sortez the casserole from the oven and serve with veal tenderloin with mashed celery. In a nonstick skillet, cook the ground beef with the garlic cloves. Sprinkle with herbs. Cook for 10 min. Peel the potatoes and cut the cauliflower. Put to cook in boiling water for 10 min. Drain and mash into a puree. Pour the hot milk and cream. Pepper. Place the meat in a greased baking dish, cover with mashed potatoes. Place in a hot oven for a few minutes then go slightly under the grill. Serve. Coffee chili paste Suzie Wan: 1/2 c.
Coffee nous mam Suzie Wan: 2 c.
Peel the ginger, onion and garlic and chop finely. Coarsely chop the bamboo shoots. In a skillet, heat 3 tbsp. tablespoons oil, fry the chopped 1 minute over high heat. Add ground beef and cook, breaking the meat well to make it as thin as possible. Add bamboo shoots, peas, bean sprouts, drained the coconut milk, sugar, coriander, curry, chili paste and fish sauce. Cook for 5-6 minutes over low heat. The mixture should be fairly dry. Otherwise, cook to let the liquid evaporate. Cut the filo pastry into 2, place the filling on one edge and fold the sheet to form triangles or squares. Heat the oil in a wok or deep fryer, fry the samosas, when they rise to the surface, they are cooked. Place them on paper towels, serve immediately as is or with slices of cucumber and salad leaves. Preheat your oven at(210 ° C). Marinate the pavement in a dish accompanied by c. tablespoons Grand Marnier and ginger, cover and let stand in refrigerator for 3 hours. Peel the oranges and cut each into 4 wedges, place them in a dish and pour the rest of Grand Marnier. Cover and leave in the refrigerator for 3 hours also. Meanwhile, wash the potatoes and cut them into 2. Oil slightly ovenproof dish and arrange them in the dish. Bake for 10 min. Wash the tomatoes and leeks thoroughly. Cut the leeks in the two lengthwise and each half into a plurality of sections in the width direction. Bake them in the same dish the potatoes for 10 minutes more. Cut the tomatoes into two, sprinkle with herbs and drizzle with a drizzle of olive oil. Bake them in a hot oven 10 minutes. Meanwhile, fry the beef barbecue pavers (or default on the oven). Add salt and pepper and add flavor with herbs. Also made the orange grill drained until they color slightly. On each plate, place a block of grilled beef, accompanied by orange slices and roasted vegetables. Sprinkle the rest of the orange liqueur. Coffee coriander seed: 1 tsp. Coffee black peppercorns: 1 tsp. Shell peas, artichoke hearts cut in two. Wash, dry and thin out the sage. Cut the meat into cubes. Heat the oil in a large casserole. When it is hot, add brown the beef cubes on all sides. When they are nicely browned, add the coriander seeds, peppercorns, 1 tbsp shave coarse salt, sage and artichoke hearts. Pour the wine over. Mix well, cover and cook over low heat for an hour putting a little water during cooking if necessary. Then add the peas to the casserole and cook 30 min. 5 minutes before the end, add the peas. Serve directly from the casserole. Mini-pumpkins stuffed Preheat the oven gas mark 6 (180 ° C). Cut mini pumpkins to three quarters of their height, and then scoop out them. Wash and seed the peppers and slice them finely. Wash, dry, thin and finely chop the parsley. Heat two tablespoons of oil in a nonstick skillet and cook over low heat 10 min peppers and onion and stir regularly (you can also add the pulpit mini pumpkins). In a bowl, mix the meat, mix pepper / onion and parsley. Once the mixture with salt and pepper, fill the shells of pumpkin meat mixture. Ask hats over and put the pumpkin in a baking dish, pour the broth into the bottom. Bake 45 minutes, basting regularly pumpkin broth. Use right out of the oven. Take 1tbsp oil into pan and fry cabbage and onion for 3 minutes. Fry mince and prawn into 3tbsp oil for 5 minutes. Now add sugar, stock, salt, soya sauce, onion and cabbage into it. Make roll of plain flour dough and roll it with vegetables batter. Seal the edges of rolls with paste of flour. Now fry the rolls into hot oil and serve with sauce. Cut the beef into thin slices and put them in a bowl. Sprinkle the chopped green olives and pepper. Mix and set aside to cool 15 min. Sew the strips of beef on small skewers and place them on the grill (or, if the oven) and bake about 10 minutes, turning regularly skewers. Boil a small amount of water with salt and pepper. Put the flour potatoes in a dish and pour water on it. Mix and then add the chopped shrimp. Form a roll and have it steam for about 45 minutes. When the sausage is cooked, let it rest for a day in the open air. Then cut thin slices and let them sit another day. Heat oil in a pan deep enough then drop it a few slices of potato chips. Let them brown a few minutes then drain them and place them on absorbent paper. Let cool a few minutes then enjoy.